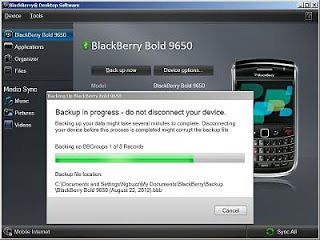 BlackBerry OS 5.0, 6.0, 7.0 Download and How to Upgrade. Do i Need to Upgrade My BlackBerry OS? Your Blackberry Device works perfectly without upgrading to the New version; But geeks and techies feel cheated. They want the New version immediately it's released. NOTE: OS = Operating system: The Main Software upon which all others are built. It serves as an Interface(GUI) between you and the Hardware. Uses: File Management, Security authentication, Network management and whatever they (RIM) put in it. 3. Download And Install the Blackberry handheld Software (100 - 200MB) for Your Mobile Operator / Region. Not all devices can be upgraded to 7.0 yet. The Popular ones are: Verizon Wireless AT&T Sprint Spectrum L.P. - For a complete list of other BlackBerry Device Software Download pages for other Mobile Operators; Scroll to the end of this page. NOTE: Enter the correct BlackBerry Device Model in the Operator Page to avoid downloading the Wrong OS. 5. You can Now Connect Your Blackberry Device to the Computer. Find and Run the Apploader.exe file, located in the same folder as vendor.xml and Follow the Install Wizard instructions to Back Up your apps and other data Before the Installation.